From time to time, it is always nice to get a manicure done and have your hands delicately cared for. One of the favorable parts of the process is choosing a beautiful nail color that best suits your mood and lifestyle. Sadly, most people are not aware that nail polish is just as dangerous as most chemical irritants. This is due to the chemical composition of each nail polish that stealthily causes damage from the outside and within the body. Popular brands today contain numerous amounts of toxic chemicals that cause hormonal imbalances and many other health problems. Back in 2015, the Environment International published a study conducted at Duke University where researchers discovered that many of the most popular American nail polish brands are extremely harmful. The study included 24 women and experts that used nail polished and evaluated the effects of the chemical toxin exposure over time. The study had concluded that all of the participants had signs of Triphenyl Phosphate in their bodies after just ten hours of application! This chemical in particular causes disruption in hormonal development. This is especially harmful for young girls who undergoing growth changes within their bodies. Triphenyl Phosphate is a non-flammable crystalline powder that is reported to be highly concentrated in polish strips, enamels, and nail polishes used for manicure preparations. (1) The compound is capable of disrupting the endocrine and reproductive system, hormones, and the metabolism. This potent neurotoxin is especially harmful for those who color their nails on a regular basis. The snowball effect of triphenyl phosphate absorbs into the body causing a slow progression of harmful effects within the body. Toluene is a colorless liquid commonly associated with the smell of paint thinners. It is used a recreational inhalant causing neurological damage over time. But, that is not all. Toluene, even at low or moderate levels, has been known to cause nausea, memory loss, hearing loss, loss of appetite, confusion, and weakness. In high levels, it has been to linked unconsciousness, sleepiness, and death. (3) Although the Environmental Protection Agency (EPA) cannot conclude the carcinogen potential of toluene, it is worth mentioning that the chemical has been associated with skin irritations and prevent suitable child development. This lovely brand sells an assortment of cosmetics ranging from foundations to lip color and nail polishes. The brand promises that it is free of the top ten toxic ingredients commonly found in most nail polishes. They strive to focus on natural ingredients- pure and simple. 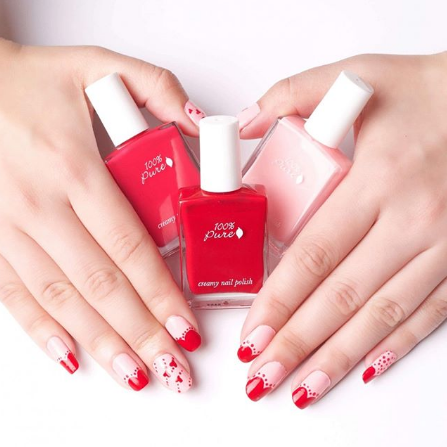 This whimsical brand is dedicated to providing an assortment of colors and all things nails. In my opinion, the brand aesthetically reminds me of Essie brand for its white topper, squared glass bottle and clean lines. Plus, their cute elephant logo, tagline of “Polish with Love”, and lack of toxics ingredients definitely won my vote! This hip brand capitalizes on non toxic fashionable nail colors without compromising luxury and nail health. They also provide non toxic remover pads infused with vitamins designed to keep your nails nourished without the noxious chemicals. These are just three of the brands out there that are vegan, cruelty-free and toxic-free. Do your research as there are many others out there that can add a splash of color without compromising your nail health. No need to expose yourself to more toxins! 1. Cosmetic Ingredient Review Safety Organization. Safety Assessment of Triphenyl Phosphate as Used in Cosmetics. 3 Jan 2018. 2. 1. U.S. Environmental Protection Agency, Office of Air and Radiation. Report to Congress on Indoor Air Quality, Volume II: Assessment and Control of Indoor Air Pollution, 1989. 3. "Health Effects of Toluene", Canadian Centre for Occupational Health and Safety.